Scientists at the Massachusetts Institute of Technology are currently in the advanced stages of a project which promises to produce hydrogen from water, cheaply and efficiently by mimicking� the way photosynthesis works in plants. The system also provides a highly efficient way to store energy. The system uses a catalyst made from cobalt and phosphorus that, when the surface is charged, can split water at room temperature. The raw materials for the system are cheap and abundant and can be can mass produced. The technology will potentially boost the importance of solar energy as it provides an efficient way for photovoltaic panels to store the energy they produce to use when the sun is not shining. Currently batteries are the only real alternative and they cannot store anywhere near as much energy per unit mass as chemical fuels. In theory, at a domestic level the system would work along these lines: During the day a photovoltaic cell would be used to generate electricity. Some of that electricity would power appliances in your house, whilst the the other part would charge the catalyst. At the same time, the catalyst would be fed water and the result would be hydrogen and oxygen. 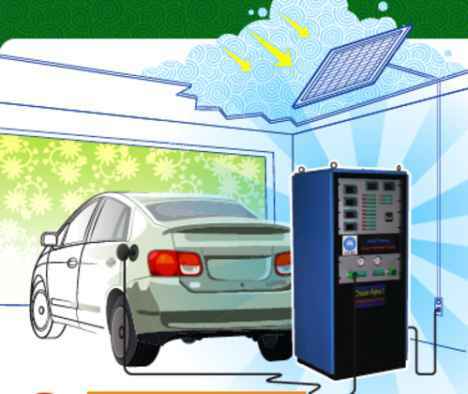 At night, the hydrogen and oxygen could be recombined in a fuel cell to produce an electrical current to power a home or recharge an electric car. An average home would need to split a few litres of water per day into hydrogen and oxygen. Converting an Olympic swimming pool of water into hydrogen and oxygen per second would create 43 terawatts of power. In the next 50 years, the world needs 16 terawatts. The practical technology is at a relatively early stage and at the moment catalyst can only accept small amounts of electrical current at once, meaning that it would be an inefficient way to quickly store large amounts of energy, but it is expected that engineers will iron out the issues and produce commercial-scale products within a decade.